Intelligently designed, reassuringly robust and backed by a superb 15-year anti-rust guarantee, this superior metal shed makes the perfect home for your expensive tools, garden furniture and bicycles. Intelligently designed, reassuringly robust and backed by a superb 15-year anti-rust guarantee, the 10x12 Yardmaster Shiplap Metal Shed makes the perfect home for your expensive tools, garden furniture and bicycles. A traditional apex roof and a gorgeous baked-on taupe and cream finish ensure that this garden storage shed doesn’t just boast brawn but beauty too, whilst the 7 layers of protection eliminate any risk of corrosion and ensure the shed’s immaculate appearance will endure for many years to come. You can gain easy access to your stored items via sliding double doors, which are overlapping, include a padlock fixing (padlock not included) and are fitted with anti-tamper bolts, so rest assured that your prized possessions will be completely shielded from the elements and safe from unwanted attention. Once inside, translucent roof panels provide an abundance of natural light, which is ideal if you’re carrying out any practical tasks. High gables make this 10x12 shed suitable for even our tallest customers, whilst ventilation along the ridge and eaves ensures optimum conditions for stored items. The roof is also fitted with guttering, not only designed to keep your shed’s walls nice and clean, but also a potential source of free water for your garden plants. 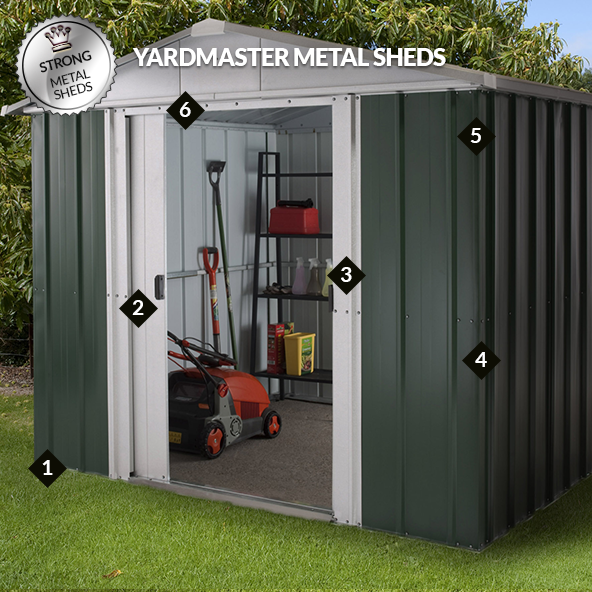 With dimensions of 224cm x 303cm x 378cm, this garden shed is supplied with an anchor kit, clearly-numbered parts, an assembly manual, rust-resistant screws and UK-based telephone support to help you achieve a simple, stress-free assembly. This particular model is available in a range of sizes. Delivery is free to most UK addresses.